South Bruny National Park is located on at the southern tip of Bruny Island off the, is an island located on the south-east coast of Tasmania. This park encompasses all of the coastline and some of the hinterland between Fluted Cape and the southern part of Great Taylors Bay and offers a wide range of opportunities for camping, surfing, bushwalking, fishing, camping and many other outdoor pursuits. Please note that National Park fees apply to access the four-wheel drive track at South Bruny Range. The 4WD tracks are graded easy, however, can become difficult following rain. And whilst they are easy, they are a lot of fun and provide beautiful scenery and a fun day out on Bruny Island. There are also a couple of short walks along the way with spectacular views if you are in no hurry. And if you are not n a hurry, you could base yourself at a great little campsite at Cloudy Corner. Head past the Captain Cook Caravan Park Adventure Bay on Bruny Island and turn right after crossing a bridge onto Lockleys Road. You will see the Mavista Falls pincic area along Resolution Road, where you can take a short walk to the falls. After a while, turn right onto Staffords Road – Clennets Road enters from the right, but stay left on Staffords. After app. 2kilometres turn left into Cloudy Bay Road. which leads to Lunawanna Road. There is access to Cloudy Bay Beach – you can drive on the beach. Nil, but take care if there has been heavy rain and if there is a hih tide. 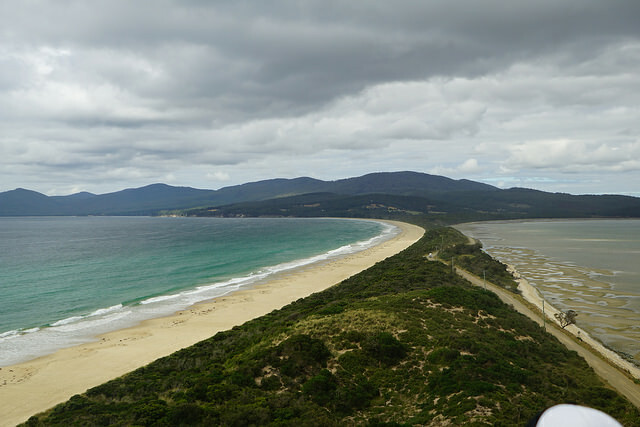 The 4WD track at South Bruny Island offers an introduction into four-wheel driving as most of the island’s roads can be driven in a standard 2WD vehicle. Please note that four-wheel driving is only allowed on the beach at Cloudy Bay at low tide to the camping area and all drivers must stay above the high tide mark to protect the fragile island environment.